Hundreds of eager little ones with self-made shakers in hand and maybe a little more sugar-fueled than usual—that’s how we start the day with our free, family fun days at Krannert Center. Throughout its five decades of impact, the Center has continued to serve our youngest patrons through enriching and engaging performances, because we know that high-quality arts experiences make a big impression on young minds. Sharing these experiences with parents, peers, educators, and other supporters further deepens the enjoyment of these activities and encourages creativity, self-expression, community building, and lifelong arts participation. 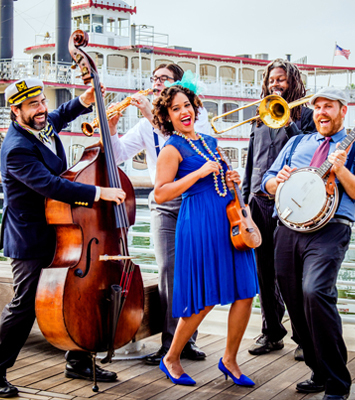 On Saturday, February 16, Jazzy Ash and the Leaping Lizards, a fabulously free-wheeling, New Orleans-fueled quintet will enliven the lobby stage in a free-for-all-ages performance. Come join us, and bring the special young audience members in your life along! And if you value these programs and want to help keep them available for everyone, consider joining our Krannert Center 50th-Anniversary Access for All Challenge. During this two-season initiative, every dollar given will be matched by generous sponsors. Part of Krannert Center’s mission is to share the transformative potential of the arts, and any contribution (no matter the size) makes a difference in furthering this purpose. Individuals, organizations, and businesses can lend their support now at KrannertCenter.com/Give. Gifts to this special matching challenge do not qualify for membership benefits. For information on these benefits or to help sponsor the matching portion of the challenge, please contact development [at] krannertcenter.illinois.edu (subject: Access%20for%20All) or 217.333.6700.